Many horse owners and riders believe that horseshoes are needed if horses are to be ridden. Some may accept they don't need shoes if ridden on soft ground but MUST have shoes if ridden on roads or rough terrain. We believe that ongoing open curiosity is your best friend as a horse owner. As we have discovered on our own journey, shoes do not serve the health, soundness or longevity of any horse - period. We have also learned that this path has been paved by many that have gone before us and we can benefit from that learning! This is why we have developed clinics to ‘TOUCH, LEARN, KNOW’ to make it as easy as possible to assess your own horse’s feet, even if you decide not to do the trimming yourself but rely on a qualified barefoot trimmer. This is why we tell people not to try to go barefoot unless they are fully committed to this path because it is not easy; it takes time, effort and commitment but you will be rewarded with a horse that is sure-footed, comfortable, and less likely to suffer concussion injuires, laminitis, navicular, or arthritis. Recent blood-flow studies by Robert Bowker, VMD, PhD, show that the horse's foot gets at least twice as much circulation when he's barefoot on yielding terrain, as compared to when he's wearing a metal shoe. The back part of the foot is designed by nature to flex, twist and distort with uneven terrain and turns--it helps reduce stress and prevent injury to joints, ligaments and tendons. Metal shoes prevent most of that twisting and flexion the hoof was designed for. The added weight of a rider does have an impact--it creates a need for more energy dissipation and shock absorption and that's the whole point of moving away from steel as a means of protection. We can provide protection through a firm-but-yielding impact by working a horse on bare feet or in padded boots. At the same time, this provides maximum support, because the whole foot is working as a unit rather than having the weight of the horse hanging from the hoof walls. Today we introduced some new horses into our herd. Providing ample space when doing this is important. The stimulation of new horses is good for them (when done safely). For the barefoot horse, our farm provides a varying terrain of sand, granite, clay, forest, and fields to adapt to proprioceptive changes in terrain. For barefoot riding (without hoof boots), it's usually important that the riding terrain reasonably match the living terrain. For instance, a horse that lives on soft pasture and spends time in a stall can almost always be expected to grow a foot that will comfortably perform in the arena or for light trail work. The same living terrain will rarely forge a hoof that can work on gravel roads and rocky trails. Climate also makes a difference to hooves, but is not a determining factor on it's own. Everything seems to be easier in a desert environment because the hooves stay tougher. Horses living in wet areas benefit greatly when their owners drain and dry up the footing as much as possible. A horse living in a wet pasture is just more likely to continue to need hoof boots when ridden on rocky ground or when traveling to a desert region for a riding vacation or competition. Hoof boots let us "have our cake and eat it, too." We get the health benefits of barefoot turnout, without missing a minute of riding. Boots aren't a "shoeing substitute"--they're better. With the various padded insoles we can use, we can almost always find a boot package that makes a lame horse feel better than he would with metal shoes. Plus, with the improved circulation and access to the hooves for trimming touch-ups, boots provide better, faster healing of problems. In general, for a horse to work completely barefoot, we're usually governed by the rule, "the more someone rides, the less likely their horse is to need boots." That's because the more hooves are used the more they adapt to the surface they travel over. On the other hand, genetics, diet, work load, conditioning, foot development, injuries and the overall health of the horse all create variables that can mean a horse will need to wear boots for work, at least part of the time. The combination of competent corrective barefoot trimming, various therapeutic pad systems for hoof boots and movement, diet and health will consistently improve most hoof problems dramatically. Natural methods are particularly effective for navicular horses, which are almost always suffering from poor development of the internal structures in the back of the foot. Constant pressure and release to the frog and constant flexion of the hoof capsule are required to develop these structures. With laminitic horses, we can relieve much of the pressure on the hoof walls (thus the laminae) and grow in a new, well-connected hoof wall while protecting the sole as needed with the pads and boots. If the walls are flared or disconnected from the coffin bone, there simply isn't a better way to grow in hoof walls with proper connection. The increased circulation and comfortable movement is of course a tremendous benefit for these horses as well. The term ‘natural horse care’ is now commonly being used to describe the care and qualities of equine life that need to be addressed in order for barefoot to work and be truly sustainable. Barefoot isn’t just about pulling the shoes. It’s also about providing a foundation for healthy, strong hooves. It can be a long path with ups and downs but we encourage you, for the love of the horse, don’t give up! The benefits of barefoot are worth it! Barefoot trimming is a technique where the horse's feet are trimmed to replicate the wear that a horse’s hoof would sustain should it be undomesticated. Horses in captivity don't wear down their hooves in the normal manner due to the fact that in most instances they are not given the time or environment in which to produce wear on their hooves. Normally the growth exceeds the wear and the hoof becomes too long and hoof deformities occur. The optimal form and length is different for every horse the same way fingernails are different on every human. This means there is no one way to trim a horse and in fact all four of the horses feet may be of different lengths and shapes. The goal for barefoot trimming is to let the hoof grow in such a way that indicates the normal wear pattern for the horse and keep the hoof at a length that best suits them. Since many horses lives are cut short by feet and limb deformities there are many benefits associated with barefoot trimming. The horse receives better circulation to the hoof without shoes as the sole/frog receives proper concussion sending the blood back up the leg. 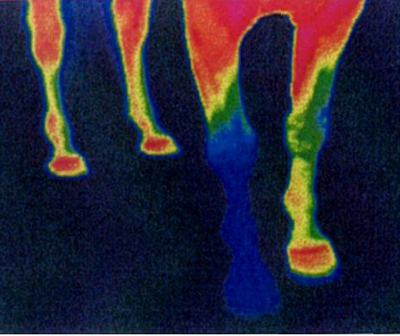 Shod horses can be seen (through thermal imaging) to have reduced circulation to the hoof. Skuffles in the herd can be quite dangerous with shod horses, but this is less so with barefoot horses. Horses have better traction without shoes. It's cheaper to have a barefoot horse than a shod one. Conditions such as navicular disease may be curable by going barefoot and can be avoided altogether if the horse is raised barefoot. This thermograph image shows a horse who has three bare feet and one with a shoe. It is quite clear from this image that the circulation has been impaired by the shoe (the large blue area is cool). What do you suppose will happen after many years of cutting off circulation to the hoof? Arthritis (inflammation), concussion and tendon/joint injuries… you may already be experiencing these with your horse. The damage to the horse’s body is one thing, and then there is the cost (veterinarian visits, prescriptions, joint injections, etc.). And what about the emotional damage this it’s inflicting? We ask our horses to put their trust in us and perform or move in intricate ways, while we are also inadvertently causing them pain and potentially shortening their functional lives. It makes no sense when we look at the big picture. It has been shown that the internal structures of the horses hoof start to deteriorate if the horse is shod and they are built to support weight and hit the ground. If the horse's weight is being suspended off the ground by shoes the digital cushion begins to lose structure and become weak. Luckily these structures are able to regenerate and grow tough again but only through removal of shoes. One of the common mistakes is that the horse owner will remove the shoes and the horse may appear lame due to the softening of the digital cushion so the owner will put shoes back on. This in fact worsens the problem as the structures continue to weaken. The only way to strengthen the horse’s feet is to remove the shoes and let the horse recuperate naturally. "This video is looking down on the coffin joint to one side, where the digital vessels and nerves live. Watch how the digital artery opens and closes with the up and down movement of the navicular bone. With weight bearing, the artery is closed, and during hoof flight it is open. This is one step in the amazing circulatory system of the hoof." (click) Tomas Teskey Veterinary Insights. There are a growing number of qualified barefoot trimmers everywhere. There are some associations that have lists of trimmers, but also many other good trimmers that don’t have formal qualifications but have read, studied and learnt how to execute a good functioning trim. There are also owners like us who have learned to trim their own horses and now trim for others. The best advice is to research, find a local trimmer and ask to see references or chat to owners who have their horses trimmed by them. Movement is critical, not only to growing healthy hooves, but to every aspect of overall health. The horse evolved to move, on average, 20 miles a day, and every part of him will generally function better if we can provide as much movement as possible. Therefore, the more miles the horse does, the more the hooves grow to compensate for wear. This explains why hooves don't 'wear out' as many people fear. When you first remove shoes, it’s important to allow as much movement as possible. 24hr turnout is preferable with as much riding on a varied terrain as possible. Allowing your horse to live with a herd in a pasture or a Paddock Paradise will increase natural movement. We can’t expect our horses to fare well on rocky or rough terrain when riding if they are only exposed to soft ground at home. The solution here is to add some varied terrain into your pasture or loafing areas (pea gravel is a great way to do this) and/or gradually increase your riding time on rough terrain on a consistent basis. You can also help your horse by putting hoof boots and pads while conditioning and strengthening their hooves. An appropriate diet is essential for a barefoot horse. Fortunately, the diet recommended for barefoot horse is also ideal for most horses, especially those ‘easy keepers’ or horses prone to laminitis: a high fibre, low sugar diet, with appropriate vitamins and essential minerals. Horses did not evolve to eat the lush green grass or the high-starch feeds that many consume today. They evolved to eat sparse, dry grasses that were low in sugar and starch. Most of us know that a sudden overload in sugar/ starches can cause laminitis, but even steady, lesser amounts of these two components in your horse’s diet can cause hoof sensitivity. A diet comprised of mostly low-sugar grass hay (12% NSC or less) is the best way to support healthy barefoot hooves. In an ideal world, horses would have unrestricted grazing of low quality scrubland with a wide variety of herbs and other plants for them to select as they need. Instead, many horses are kept in rather rich grass pastures or on restricted grazing paddocks (due to the rich grass pastures). Good quality hay is a useful addition if grass is restricted or during winter. Additional feeding may be required due to workload or restricted grass intake. To support a healthy horse, and therefore healthy hooves, the horse needs a good intake of all-round vitamins and minerals. Zinc and copper are deficient in most horses’ diets, and these happen to be two very important minerals for the hoof. Another common issue is that of too much iron, which can block the absorption of whatever zinc and copper the horse may be getting. It’s also important to provide both major and trace minerals in the correct ratios. You can find out how to get the right balance by getting your hay or pasture tested and analyzed. Check out our hay testing service ➠HERE. We also cannot forget or ignore that some horses do have a metabolic condition such as Insulin Resistance or Cushing’s that will also play a role in their dietary needs. These horses require a balanced diet with special supplements and exercise to be sound. Finally, we can't say enough about the benefits of free choice trickle feeding with slow feeder hay bags. A well thought out paddock paradise, or at least many bags placed throughout a property, can provide that much needed movement (for gut mobility and a functional hoof) and happy gut bacteria (micro-biome) essential for optimum digestive health.